Soothing Aloe Cosmeclinik Sativa 250ml. Aloe Vera Gel for the care and protection of the skin. Hydrating, soothing and refreshing. PRESENTATION: Dosficador 250 ml. Excipient: Gel made with a cool gelling agent of natural origin. Preserved with a mixture of phenoxyethanol and parabens. INDICATIONS: Aloe vera gel for the care and protection of the skin. Moisturizing properties, decongestants, soothing and protective. Provides an immediate feeling of freshness and wellbeing. 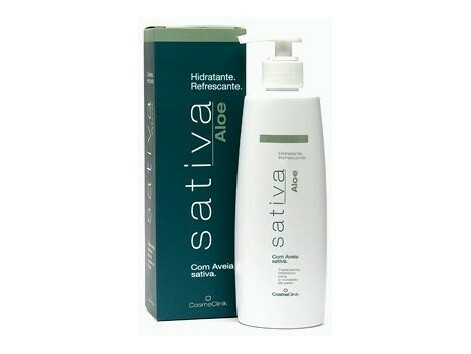 Avena Sativa accentuates the soothing and decongestant action of Aloe vera. Particularly suitable for application in areas irritated, scaly and sensitive subject to aggressive treatments, where other cosmetic preparations may cause skin maceration, such as armpits and other skin folds. Reduces dryness and flaking. DIRECTIONS FOR USE: Apply 2 or 3 times a day. Then exert a gentle massage to facilitate absorption. NOTE: For patients treated with radiotherapy, not apply the 2 hours before the meeting. If in doubt consult a specialist. ACTIVE PRINCIPLES: Aloe vera gel: Hydrating properties, soothing, refreshing and regenerative. AVENA SATIVA: emollient, soothing and decongestant. EXTRACT Camomila: reduces inflammation and moisturizes the skin epidermis. PROPERTIES: Softens and moisturizes the skin produndidad. Refesca and calms the skin, reduces redness. Restores the water balance of the skin, prevents skin dryness and irritation.